Today we took a ferry from Marin County to San Francisco. We disembarked at the Ferry Terminal, which is a beautiful rehab now housing great food shops. 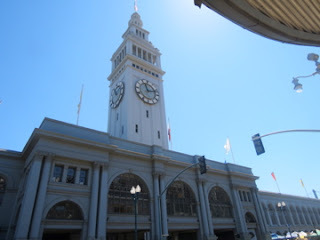 Exiting the other side of the terminal, we are on The Embarcadero in the financial district. Also beautifully rehabbed with new/old trolley cars. I love the architecture, especially the contrast of old and new, and the palm trees! To me this looks like an old post card.